AMD's CPU division has had a heck of a few months. Its Ryzen 5 and Ryzen 7 CPUs established new levels of bang for the multithreaded buck. The Ryzen Threadripper 1920X and Ryzen Threadripper 1950X put the company back in the high-end desktop game for the first time in many years. Benchmarks suggest that Epyc server CPUs present compelling values versus the Xeon Scalable Processor family, too. Those processors are all impressive enough, but AMD's most important Ryzen CPUs will likely be those with an integrated graphics processor on board. A chip with integrated graphics is critical to addressing the needs of the vast majority of PC users at home, in the office, and on the go. For most users, the integrated graphics processors in Intel's CPUs offer more than enough pixel-pushing power, and those IGPs drive the vast majority of displays out there. An integrated graphics processor is also essential in the thin-and-light notebooks that make up the bulk of PC sales these days. Try as it might have, AMD's past APUs with Radeon graphics on board didn't set buyers' hearts on fire. Consequently, and much as it has with Xeons in the data center, Intel has long enjoyed a vast market-share advantage over AMD in the attractive mobile market thanks to its finely tuned process technology, architectural advantages, and highly scalable CPU designs. Today, though, AMD is putting the final puzzle piece in place for a fully competitive Ryzen CPU lineup with its Ryzen 5 2500U and Ryzen 7 2700U mobile APUs, both of which use the system-on-chip formerly code-named Raven Ridge. Although the official series name for these parts—Ryzen CPU with Radeon Vega Graphics—is a tad unwieldy, AMD's latest attempt to fuse CPU and graphics processing power seems more elegant and compelling than it's ever been. See, APUs have always boasted far better integrated graphics performance than Intel's CPUs, but that graphics power was paired with CPU cores that trailed Intel's in the kinds of single-threaded workloads that make up the bulk of most regular folks' computing tasks. Outside of a couple niche cases like HTPCs or truly bargain-basement gaming builds, past APUs never really found a natural home in our recommendations for system builders thanks to that unbalanced performance. 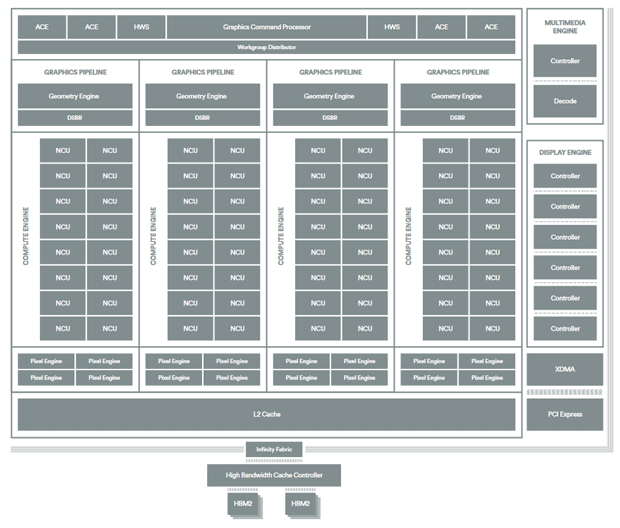 The Zen CPU architecture seems poised to change all of that. As the past few months have shown, AMD finally has a CPU core that's competitive with Intel's latest and greatest, even if it can't quite match Skylake and its derivatives clock-for-clock and in every workload. The Haswell or Broadwell-class performance that Zen provides has proven sufficient for many PC users, and folks with even older chips have long been digging in their heels. We also know that Zen is quite power-efficient, since Ryzen CPUs have had no trouble keeping up with Intel's latest on that front in our estimations. 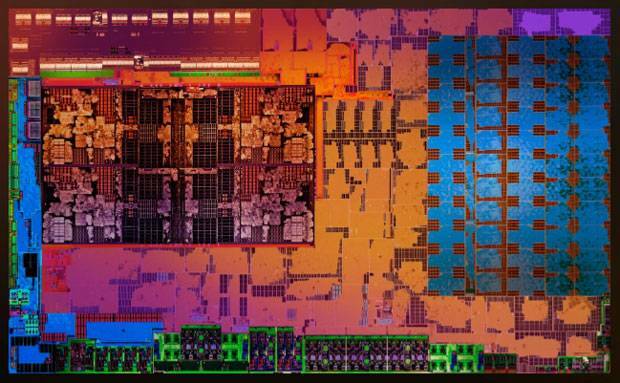 AMD's Vega graphics architecture may also mark an important step forward for the Radeon graphics on APUs. Although the vaunted High-Bandwidth Cache Controller has been replaced with a custom memory controller for Raven Ridge APUs, other Vega architectural features could still make Radeon graphics a better fit for APUs than ever. For example, the Draw Stream Binning Rasterizer, a form of hybrid tiled rendering, helps to reduce pressure on off-chip memory bandwidth by keeping the data associated with each tile (or bin) in on-chip cache and minimizing data movement between on-chip and remote memory. In a relatively bandwidth-rich implementation like that of the Radeon RX Vega discrete graphics card, the DSBR's economizations might not be keenly felt, but I'd be willing to bet that they'll be useful in the bandwidth-restricted confines typical of Ryzen APUs. Outside of its core CPU and GPU IP, AMD's design teams are working with a more consistent set of building blocks than they have been over the past few years, too. Although the company didn't talk much about this fact in its presentation, it's worth noting that the Zen and Vega architectures have been tuned for and produced on the same 14-nm LPP process from GlobalFoundries from the get-go. That common production process would seem to make integrating both parts on a single die much easier than it may have been in the past, where AMD apparently had to prioritize performance on some parts of the chip (e.g. Kaveri's integrated GPU) at the expense of peak CPU frequencies. That 14-nm process could also provide better performance scaling as TDPs for Ryzen APUs climb well past the 15W envelope that AMD is initially targeting, too, an important consideration for chips that will presumably drop into desktops built on the Socket AM4 platform. Carrizo APUs, for example, were designed around a 28-nm high-density logic library that was typically used for GPUs. That high-density library reduced die area and power consumption to fit those chips into their optimal 15W TDPs, but that choice resulted in less-than-ideal frequency scaling in more relaxed thermal envelopes. Recall that the only Carrizo chip offered for the desktop was the graphics-free Athlon X4 845 at 65W. That sub-optimal scaling doesn't seem like it should be a problem with Raven Ridge. Radeon RX Vega 56 and RX Vega 64 graphics cards. 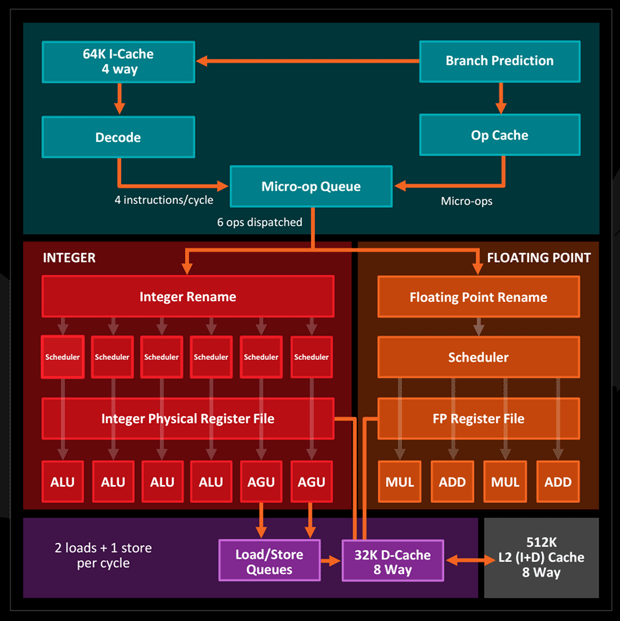 All told, the use of the Infinity Fabric to tie together Zen CPU cores and a Vega graphics processor in an SoC fabricated on a common 14-nm process would seem to be the most complete realization so far of the "SoC-style approach" that CTO Mark Papermaster sketched out all the way back in 2012, and it may well be the best example of the revitalized AMD firing on all cylinders. Depending on how one looks at it, Ryzen APUs are the culmination of a years-long journey or the first step into a new era. Probably both. Let's see how AMD plans to tackle Intel's mobile-market dominance.